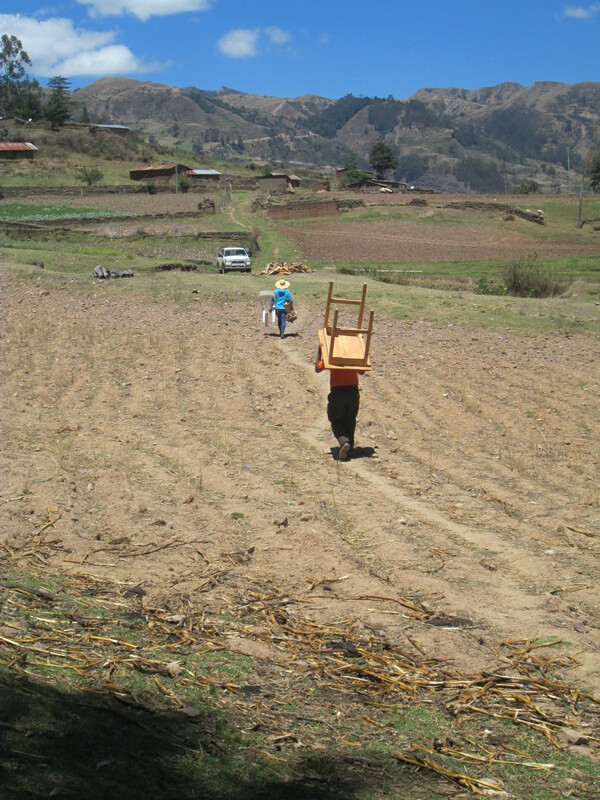 At 8am Tuesday morning following Spinzilla Spinning Week the contracted pickup truck arrived to transport the Warmis Phuskadoras Team Captain, Doña Máxima, Dorinda (PAZA), and Shelby the social media volunteer to the rural community of Sanipaya to measure the yardage spun by 7 team members. The truck was quickly loaded with the measuring necessities including a wooden table with yard long measurement marks, 3 plastic chairs, 2 low wooden stools, 2 plastic buckets, and a bag of beverages. The truck wound its way up out of the Palca River valley and across the mountain tops past the turnoff to Huancarani and continuing on another half hour to the Sanipaya turnoff. It was another half an hour of winding down the mountain past the school and health post before finally stopping at what appeared to be the end of the dirt road. 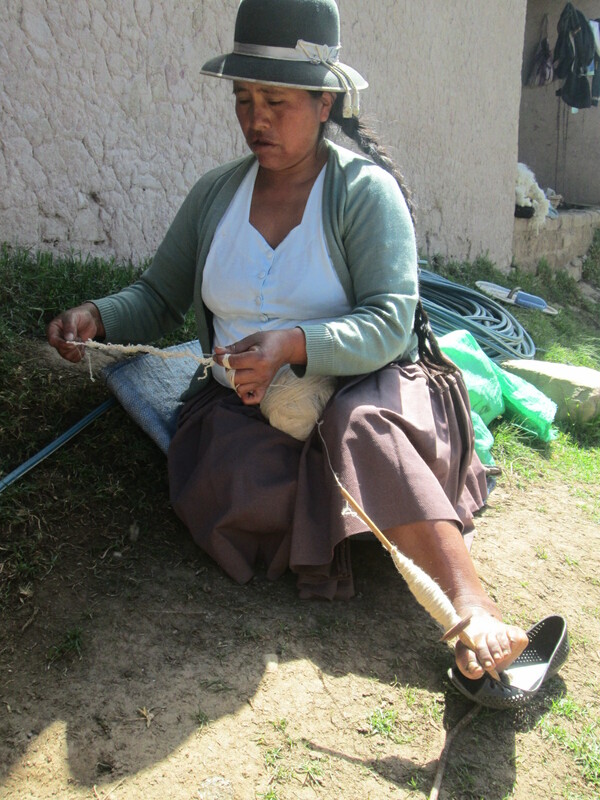 Doña Beatris, is a Club de Artesanas (CdA) member, and divides her time between Independencia and her farm in Sanipaya. Last year she organized 2 other women in Sanipaya so the 3 of them could participate in Spinzilla, and this year she had organized 6 other spinners. She waved at us from her house which was on the other side of a wheat field that had been harvested and turned under. Our driver, Don Vicente, was a great help all day. He carted the table through the field to Doña Beatris´s house, and served as a recorder to complete a third measuring team. Shelby worked as she had the day prior in Huancarani by recording for Doña Máxima and Dorinda who sat across from each other at the table calling out after every 5th yard they measured. The spinners rewound their balls of yarn as they were measured. There were breaks to stop and talk since 4 of the spinners were new to the competition this year. The spinners of Huancarani had experienced Spinzilla last year and had a full year to think and talk about it. They also have worked with PAZA since 2007. 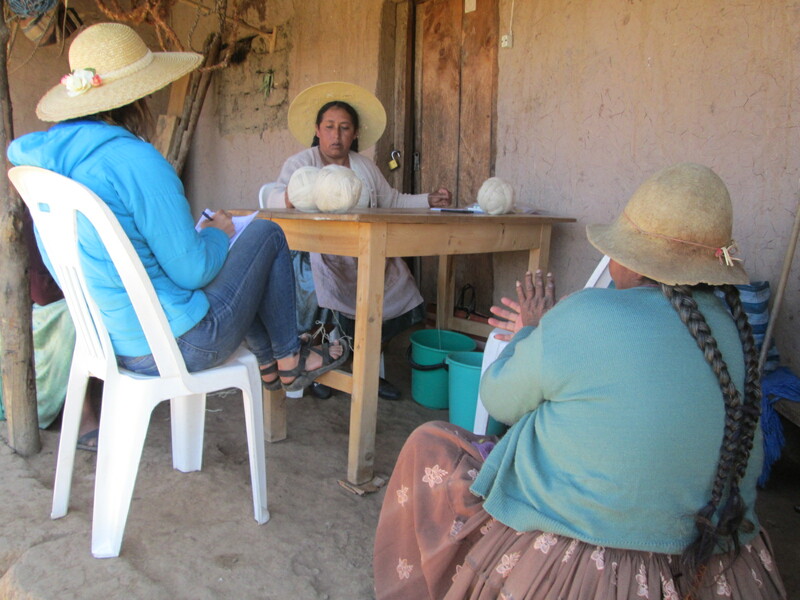 As a Peace Corps volunteer in 2008, Dorinda had presented 2 natural dye workshops in Sanipaya. Unfortunately due to local politics a working relationship never developed between PAZA and the weavers of Sanipaya. The last yarn measured this year belonged to Doña Rina. Her 2 balls of spun yarn were single ply and needed to be a double ply for measuring. 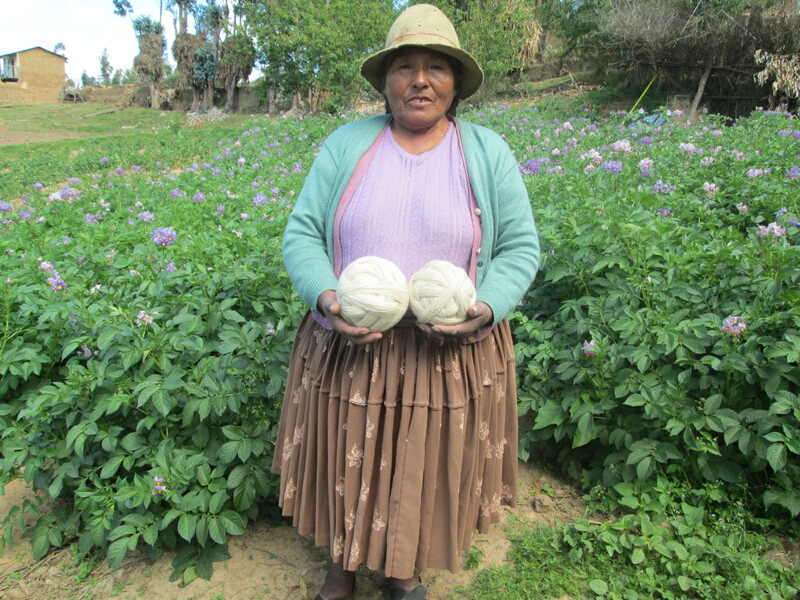 Doña Máxima put each ball into a separate bucket at her feet so she could combine the 2 strands for measuring. Because the balls of yarn were different colors, they had to be separated after being measured. Doña Juana sat beside Doña Máxima to keep the measured yarn from snarling and fed it out to Doña Rina and Doña Tomaza who had formed a triangle to each side so they could each rewind a single strand. The standard practice to wind 2 drop spindles of spun yarn into a ball is to place a filled drop spindle between the big toe and the next toe of each foot and wind the 2 strands together. Give it a try…. Doña Beatris and her daughter Adviana who lives in Independencia and is a CdA member have been selling weavings through PAZA since 2012. 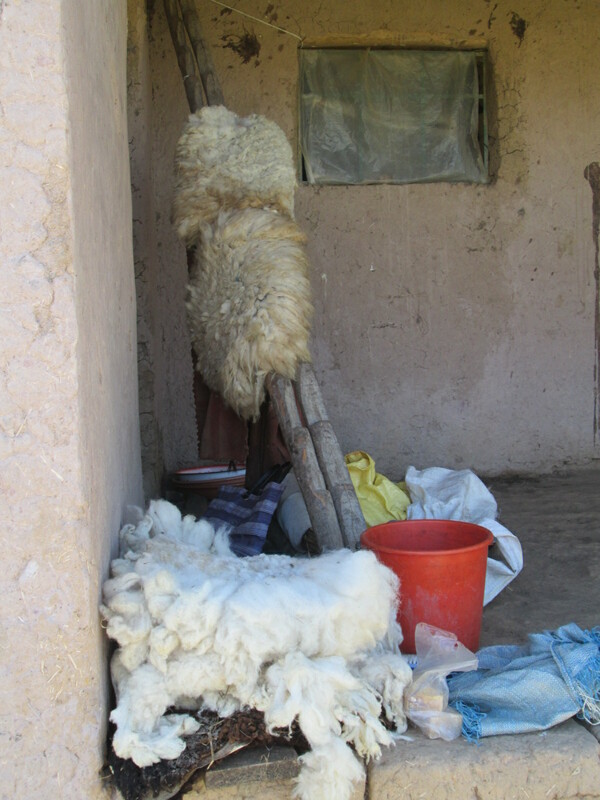 The other spinners expressed interest in working with PAZA to sell weavings. 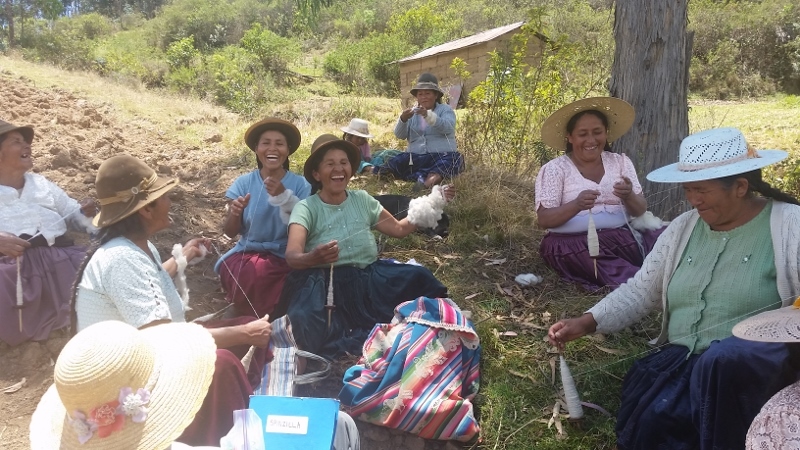 A few workshops in Independencia will be necessary to teach natural dye recipes and how to weave to size specifications which the Huancarani weavers have been working on for 4 years. 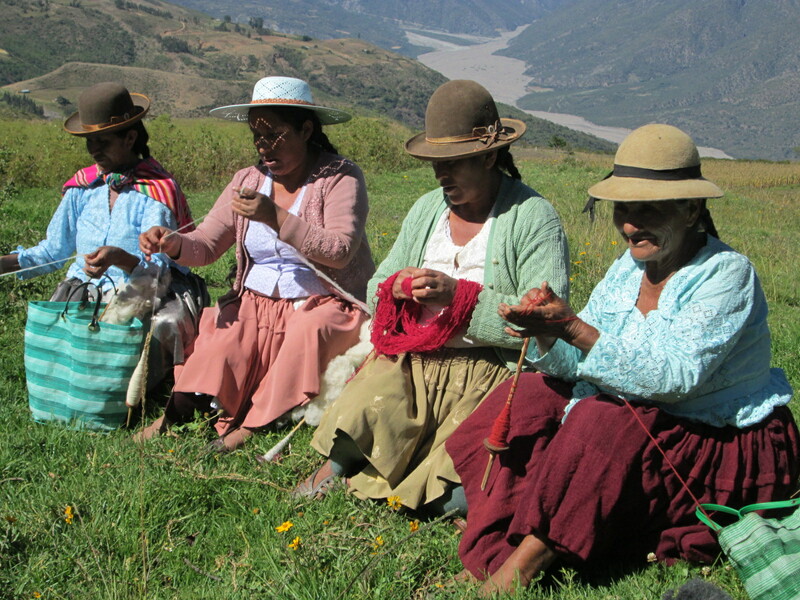 The piece missing in the government and non-profit organizations development projects concerning rural women generating income through the fiber arts is the sales and marketing. 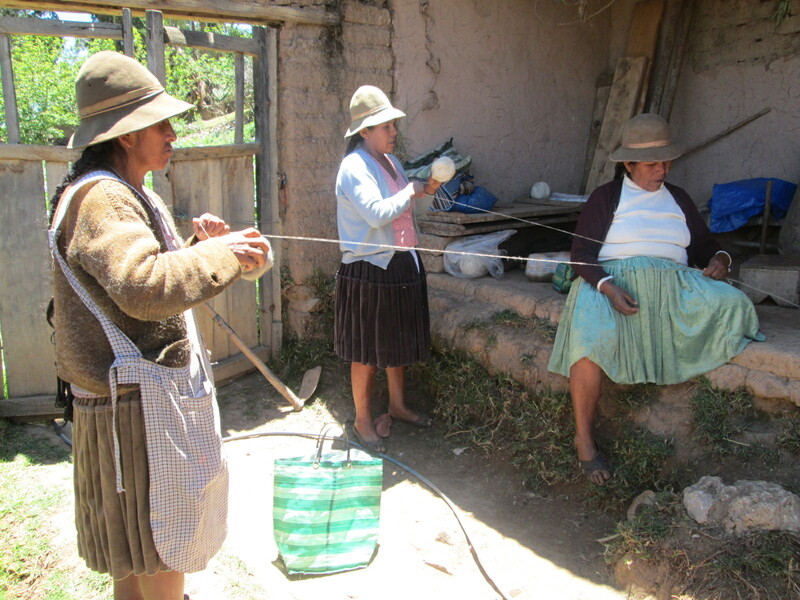 PAZA´s partnership with the local government to work with the Women´s Organizations in rural communities ended rather dramatically at a public meeting in Independencia in 2010. The results of the Spinzilla competition will be presented to the mayor of Independencia with the hope it will help open the doors to local partnerships.